The fishing village of Velddrif lies at the mouth of the Berg River on the Capes' West Coast and is part of the Crayfish Route. The annual Berg River Canoe Marathon ends in Velddrif and has a reputation for being one of the toughest courses in the world. It is common to see the rickety wooden jetties with the dried fish speciality “Bokkoms” hanging up to dry. 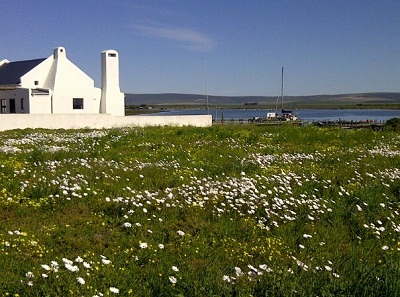 Velddrif have a long list of accommodation options including camping, self-catering units and cottages, farm accommodation, bed and breakfasts, guest houses and hotels. For details please contact Velddrif Tourism Bureaux at +27 (0)22 783 1821. Velddrif on the West Coast.